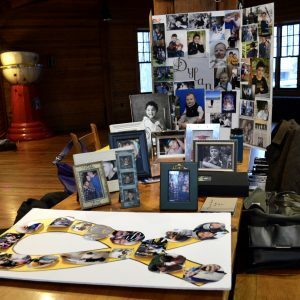 Each year after the holiday rush has settled, in the quiet months of winter, Why Me hosts a weekend retreat for parents who have lost a child to cancer. The retreat began in the 90’s and has traditionally been held in a camp like setting over a three day two night weekend, giving parents an opportunity to explore their grief away from the demands of daily life. 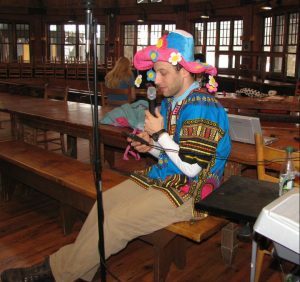 This year, parents gathered at the The Grotonwood Camp in northern Massachusetts. As parents arrive for the weekend starting with Friday night dinner, the dining hall swelled with hugs and hellos. Tables fill with photo boards, albums and mementos – traveling shrines. Between 30 and 50 parents gather at the retreat each year – some have been coming for decades others are newly bereaved – all hoping to gain some new understanding of where they are and where they have been. It can be difficult to keep up with life after your child dies. As the years go on the grief shifts but it never goes away. Taking away the demands of everyday life, the weekend retreat offers parents who are in all stages of loss a few precious days to reflect on the time that has passed and explore their ever changing feelings after loss. Grace and Anthony Fortunato first came to camp in 2015 after their son Dylan died of relapsed ALL (Acute Lymphoblastic Leukemia) at age 13. At the time, the retreat was held at Hole in the Wall Gang Camp where the Fortunato family shared many memories over the years. “Hole in the Wall was a magical place where he (Dylan) was able to go and feel like he belonged. He could be with other kids like him. His brothers could also better understand his experiences and feel included. They could talk about cancer but also just have fun.” Ms. Fortunato remembers. She draws the parallels to her experiences at the Why Me retreat. It has been a difficult year for Grace and Anthony. She has been struggling with health issues and he recently suffered a heart attack. It is not uncommon that parents find their own health failing after the devastating loss of a child. Years of consuming treatments, hospital stays and therapies often means parents put their personal needs aside. At camp many parents share similar stories. “We spend so much time taking care of everyone else, when it’s over we find ourselves broken in so many ways. It is hard for our friends and families to relate. It is hard to put our family back together. I worry about my other children, Jordan and Ryan. I was away caring for Dylan for so long.” Mrs. Fortunato explains. Caring for surviving children is the most talked about topic in bereavement support groups. A few years ago it was offered that adult bereaved siblings could accompany their parents to the retreat. This shift in the programing has proven to be of great value to both the siblings and parents. In bereavement groups everywhere surviving children are often a main topic of conversation. Including their perspective (as adults) at the retreat gives parents of younger children insight on how to best help their children cope with loss and the assurance that their children will in fact be ok. Likewise, adult siblings share that they feel humbled by the depth of care and concern they see from the grieving parents towards their surviving children. While grief is often thought of as a solitary venture this exchange across generations helps neutralize some of the deepest pains. Grief is, after all, about love and connection. The retreat is set up to provide space for tending to that love, an act that is often misinterpreted by the outside world. Here, parents can be the parent of a child who is not living. They can reminisce and tell stories that happened decades ago as if it were yesterday. Sharing experiences as a group creates an opportunity for parents to reflect and see how far they have come, while being surrounded by the insights of those who are further along. After time, parents who once struggled to show up find themselves helping others, something they never thought possible. Together they discover that there are few things more healing than being in community with each other. The weekend is facilitated by Lou Bergholz who has been with the group since 1999. Lou adds a levity to the retreat, anchored by an awareness and sensitivity to the group’s needs that can only come from time and experience. He opens the door for parents to connect and laugh without guilt – sometimes for the first time since their child’s death. ”This group has become an extended family to me. I have seen the growth and healing happen among the long-timers, and the hope and connection happen for newcomers. The journey through grieving is not time bound or easily plotted. It’s been a profound honor in my life to bear witness to participants in this group making their way.” Bergholz explains. Camp teaches you that you can have joy and sadness in your heart at the same time. “I always look forward to seeing what Lou has planned for us. With Julian entertaining us with music and Debbie having lots of craft activities for us to work on. It is a good balance.” Fortunato shares. This year, like every passing year, was different and new. For the first time since its inception the Circle of Healing retreat was held in a new location. While the walls that held us felt unfamiliar at first in the end the weekend proved that the power and the purpose lie in the people not the place. Further information regarding our support groups can be found here.